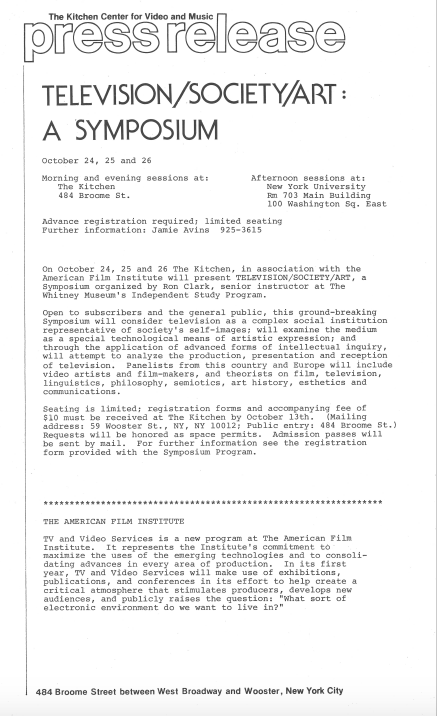 Television, Society, and Art was a three-day symposium centering on the subject of television's increasing presence in society and culture, as well as the ramifications of this development in the world of art. Panel discussions considered the perspectives of both artist and audience, proposing the formal possibilities and limitations of digital technology, as well as assessing television as a popular media that allows communication with a mass audience. The event constituted an attempt to reconcile the advent of television with an artistic narrative even while imagining futures made available by the new media.